FLEX is based on the work Net Objectives has done for almost 20 years in Agile and Lean methods. It is not a set of practices, nor a framework. Rather it is what we have found that works to achieve business agility, the quick realization of business value predictably, sustainably and with high quality. It is based on making the right decisions, at the right time with the right people. These decisions are intended to achieve particular objectives. To keep it from being abstract, we have created a set or practices that can be used in certain situations. 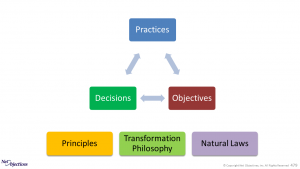 This triad of decisions, objectives and practices are defined within a context of principles (guidance) to follow, laws of nature to be aware of and a philosophy of learning that we’ve found to be effective. This relationship is shown in Figure 1. FLEX explicitly states the objectives that must be met in order to achieve business agility. Decisions on which practices are to be used are made according to the context you are in and the principles and learning philosophy that has been demonstrated to work. Natural laws need to be attended to because when they are not, they will still impact you. The decisions, objectives and practices are being expanded on the FLEX Solutions page of the FLEX site. See FLEX’s Philosophy of Transformation. This also discusses the learning philosophies of Scrum, The Kanban Method and SAFe and how FLEX’s model can enhance those. There are natural laws that must be attended to in developing software, whether product or IT. This is akin to attending to gravity, compression strength and elasticity when building bridges. You can ignore them, but they won’t ignore you.